Manga has become one of the most important narrative mediums in the world, all in its own right. Nowadays it’s nearly impossible to find someone who’s unfamiliar with series like Dragon Ball, Naruto, or One Piece. Well, we’re sure there’s someone out there, but that’s not the point. 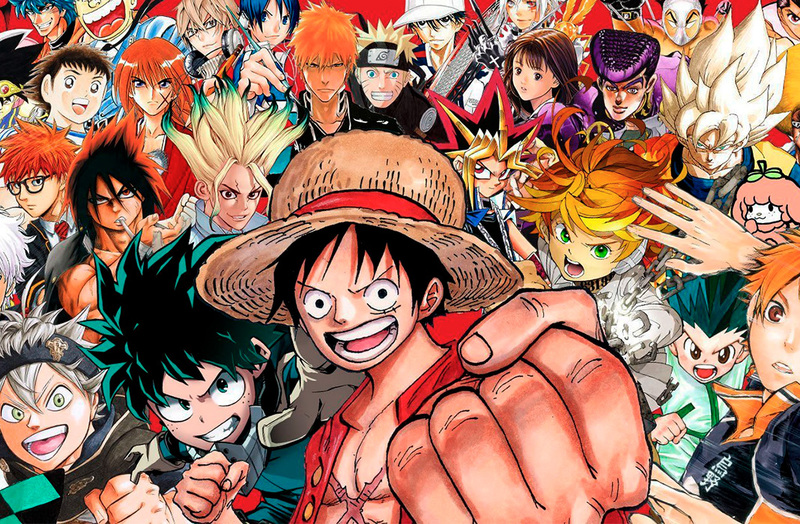 The important thing is that from now on, it’s going to be super easy to read all the best manga: MANGA Plus is a new app created by Shueisha, the publisher of Shōnen Jump. 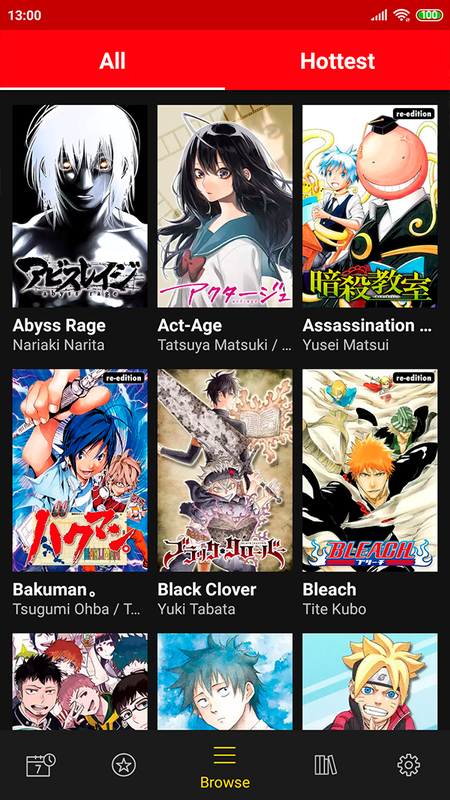 It’s an app that lets you enjoy manga from the publisher for free and legally. That’s right, we said legally. The mission of MANGA Plus is incredibly appealing: to bring manga to every corner of the planet for free. An idea that many people already assumed was a given, due to the enormous number of “scantalations” that exist. But the key to MANGA Plus is that it’s completely legal to read these manga. Although it’s still a tad too soon to talk about revolution, this move by Shueisha is going to change the way we read manga. Without a doubt. But let’s get down to the nitty gritty: MANGA Plus currently offers about 50 series, although it all depends on the country where you’re located. 30 of these manga are published regularly, so you’ll be able to read new chapters at the same rate as readers in Japan. And once again, legally. 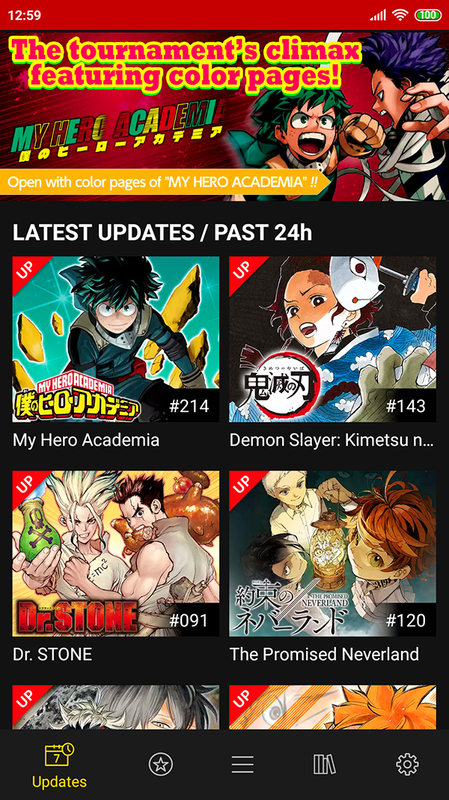 This number is sure to grow in the near future, although all the top manga are already available: One Piece, My Hero Academia, Black Clover, Boruto, Dr. Stone, Dragon Ball Super, The Promised Neverland, Demon Slayer: Kimetsu no Yaiba… We could go on and on, but here’s a link with a quick summary of the available series. In addition to the regular publications, MANGA Plus also offers legendary completed series like Naruto, Death Note, Dragon Ball, Bleach, Rurouni Kenshin, JoJo’s Bizarre Adventure. It’s like Christmas day for any true manga fan. That said, with MANGA Plus, you’re not going to be able to binge read all the chapters at once: only the first three and last three chapters of each series are available. In the case of completed mangas, you can only read the first three. Within each series you can see when a new chapter is posted, even with the completed series. When this new chapter is released, one of the old ones will stop being available. This way, there are always just three chapters available —or six if the manga is still being published regularly, as we mentioned above— at all times. The app’s interface is simple and functional, letting you conveniently browse through its tabs at all times. 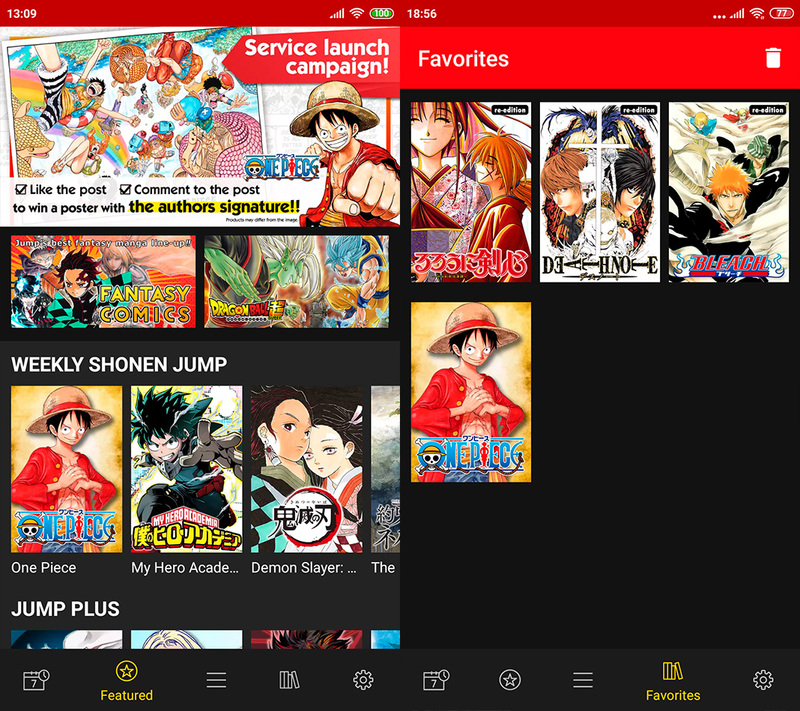 In the main page, you’ll find the latest releases for you to read and in the rest, you’ll find various methods to search for mangas: divided by magazine (Weekly Shônen Jump, Jump Square y Shônen Jump Plus), by name, or by popularity within the app. 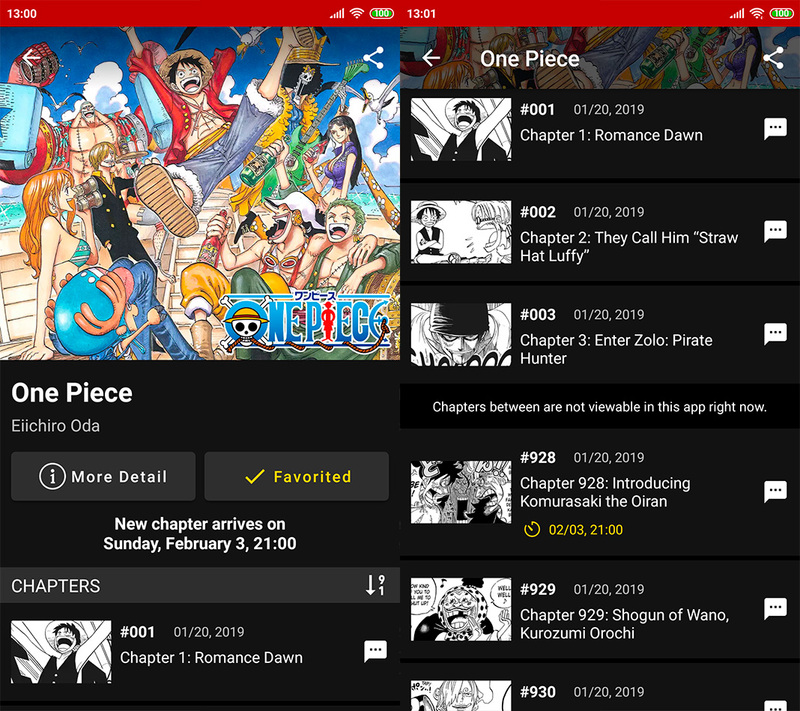 Another important section is the one that holds your favorite manga, letting you quickly and easily access the series you’re most interested in. And if you’re in an area with a less than reliable Internet connection, the app gives you the option to download the pages in low resolution. 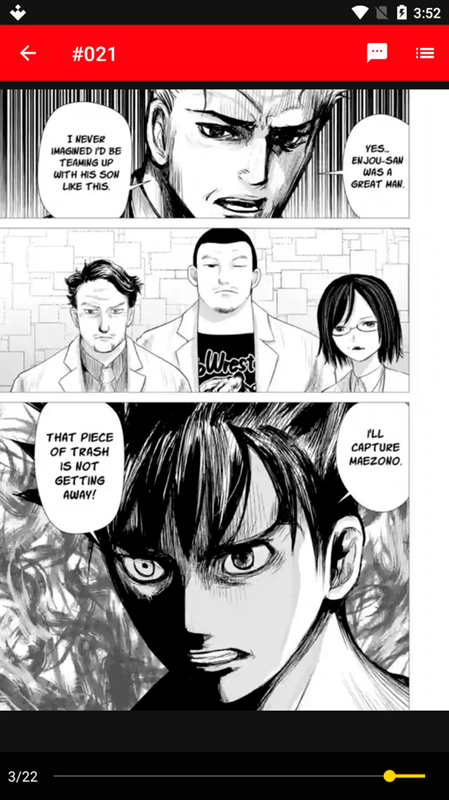 It’s impossible to hide our enthusiasm when we find an app like MANGA Plus by SHUEISHA. To enjoy the most relevant mangas for free and legally is something that used to be hard to imagine. But this fact is finally a reality and most importantly, the app is just getting started. The existence of this app could possibly cause a whole paradigm shift in how we consume manga. Plus, there’s minimal ads, only showing them at the end of each chapter and without being considered intrusive at any time. Three cheers for SHUEISHA!